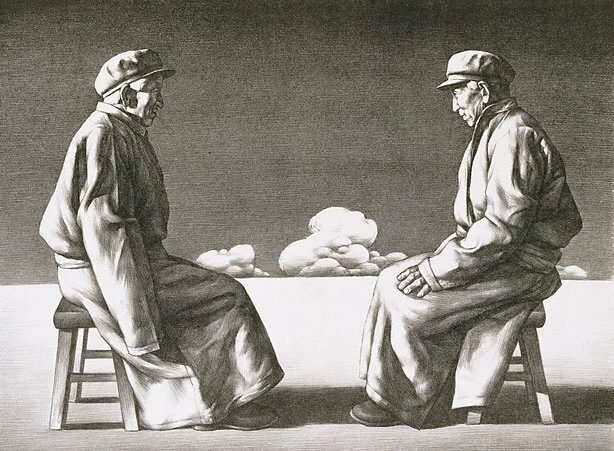 The artist is a skilled printmaker from Inner Mongolia whose still, eerily lit tableau potently evokes a tense and alienating world. The Asian Collections, AGNSW, 2003, pg.178., The artist is a skilled printmaker from Inner Mongolia whose still, eerily lit tableau potently evokes a tense and alienating world. The Asian Collections, AGNSW, 2003, pg.178. Signed and dated l.r., in Chinese, pencil "Su Xinping 1989".